The Comments Page from the men who served at the 693rd Radar Sqdn. I enjoyed seeing the pictures and videos and the names I recognized at this time are JOHN BROWN (my old supervisor), JOHN T. MCGREEVY (co-worker), CHARLES MCKNIGHT (MY OLD NEIGHBOR), JOHN TOLBERT(co-worker), CLARENCE WILSON(co-worker), SAM GURNEY (co-worker) and KEN BREITENFELD (trainer / teacher). I considered all these men my friends and there were many others I can't recall at this time). 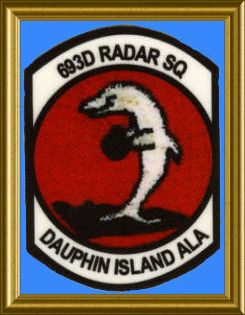 I was stationed at the 693rd AF station from August 1966 to May 1969 in the search radar tower. In June 2005 we stayed in one of the old base houses right on the beach with 4 of our grandchildren and enjoyed it very much. When we were first stationed at the radar site we rented one of the Cloud Burst duplex apartments and noticed one of them is still there and may be the one we rented (it appeared to be in sad shape). We later moved to a little house near Cadillac square in the piney woods towards the back bay area and is still there looking better than when we lived there. Our daughter was born while stationed there and baptized at the Catholic church on Dauphin Island. I retired as a MSgt in 1986 and presently employed as an engineer for Lockheed Martin in Fort Worth TX. Great assignment. It was the 635th Radar Squadron when I was there. I was at 24th Air Division at Malmstrom AFB, Montana when NORAD asked for volunteers to reopen radar sites in the Southern Air Defense System. I volunteered and lett Malmstrom 31 Oct 72. I had a great supervisor (Capt Johannes Van Ooyen) and had met the commander (Major John C. Mueller) when I was at my second remote (Kume Jima, Okinawa) in 1966 or 1967. He came to the site to inspect Radar Operations. One day I talked with the First Sergeant (SMSgt Hudson) and told him I had long wanted to attend the NCO Academy. SMSgt Hudson called the ADC NCO Academy at Tyndall AFB, Florida and got me a slot. I was separated from my first wife when I arrived at Dauphin Island and had filed for divorce while at Malmstrom in April 1972. There were no barracks for single/separated personnel and the first month or so we used the old base housing which was then Coast Guard recreational housing. I next moved! in an apartment in mobile for about two months and finally we were authorized housing on the old Brookley Field in Mobile. It was great because they put three guys in a three bedroom fully furnished house. One of the guys who shared the house with me was from Fort Walton Beach, Florida and he went home every weekend and holidays. The other guy was from Louisiana and he went home almost every three days break he had. I often had the house to myself. Montana threw my divorce out because I was not a resident and was no longer stationed there. I went to Pensacola, Florida in July 1973 and filed for divorce because I was a Florida resident. I left Dauphin Island on 1 Jan 1974 and started the NCO Academy the next day. I graduated from the NCO Academy on the night of 14 Feb 74. I got up at five the next morning and drove to Pensacola, and went to court, and the judge granted my divorce. I was a very happy young man. You have a Jerald Hudson listed. He was the First Sergeant (SMSgt) when I was there from 11/72 to 1/74. Major John C. Mueller was the Commander, Captain Mark K. Schaeffer was the Squadron OIC Operations, and Captain Johannes Van Ooyen was the Squadron OIC Stan/Eval and Training. I am looking at my APR they wrote and signed.on 16 Nov 73. Dauphin Island was a great assignment that I will never forget. I updated my data. I was stationed at the 627th Rdr Sq Crystal Springs AFS Miss from Feb 63 till Jun 64 and at the 693rd Rdr Sq Dauphin Island Ala from Jun 64 till Jul 66. BEST DUTY STATION OF ALL. MET A LOT OF GOOD FRIENDS. I ran the Theater and worked in Radio Maintanence. Had a lot of fun on the Island and also weathered a Hurrican in 1964 or so. I was on the bowling team and we ended up in 2nd place. Went from Dauphin Island to Osan Korea and assigned to a covert operations unit. Part of the Combat Forward Air Controllers Group FAC / ROMAD / TACP. Went to Vietnam with the Korean Tiger Division and then returned to Korea. Went to Jungle Survival School at Clark AB. Assigned to Americal. Might visit the DASF page on this same link and look for the 4th DASF find my name and see what I did in Korea and Vietnam. Present at opening of site. Manual to Sage. Maintained AN/GPA-37 --Radar Course Directing Group Waste of time and money!! If I could have stayed on The Island, I would have been in the USAF for 20 years. After my time in the Phillipines, Thailand and Viet Nam, in September of 1965 I knew I wanted out of the Air Force. so I did not sign up again. I then went to work for Braniff International Airlines. Didn't Joe Moore play the drums with the band with Curtis Shelman? I can't believe its been this long and the changes made to the island. Does anyone remember fishing off the coast guard cutter and playing basketball at the WMCA League in Mobile and Huricane Camille? Got $3.00 travel pay to go from Keesler AFB to Dauphin Island. Sat through two hurricanes, neither one very bad, but got in trouble for wearing my bathing suit to go out and lash down the antennas of the FPS-6's. Had to come back down because the rain drops were like bullets. Things got a little tense during the Cuban Crisis. Had to take turns walking the fence line with an unloaded carbine. Go figure. Spent my off hours in the summers working on a charter boat as 1st mate for Leon Esfeller. Made a lot more money than what I was getting from Uncle Sam. I'm not real good on names, but I was on duty when one of our illustrious APs accidently discharged his sidearm during change of guard in the Operations guard shack and the bullet went through the commander's window. Good thing it was 11 PM. He suffered from shock and powder burns across his belly.. Same guy got put into Special Services and ran our tractor off the end of the pier. All in all, it was great duty, but zero promotions. Probably would've stayed in if there was any hope of a promotion. Great assignment. It was the 635th Radar Squadron when I was there. I was at 24th Air Division at Malmstrom AFB, Montana when NORAD asked for volunteers to reopen radar sites in the Southern Air Defense System. I volunteered and lett Malmstrom 31 Oct 72. I had a great supervisor (Capt Johannes Van Ooyen) and had met the commander (Major John C. Mueller) when I was at my second remote (Kume Jima, Okinawa) in 1966 or 1967. He came to the site to inspect Radar Operations. One day I talked with the First Sergeant (SMSgt Hudson) and told him I had long wanted to attend the NCO Academy. SMSgt Hudson called the ADC NCO Academy at Tyndall AFB, Florida and got me a slot. I was separated from my first wife when I arrived at Dauphin Island and had filed for divorce while at Malmstrom in April 1972. There were no barracks for single/separated personnel and the first month or so we used the old base housing which was then Coast Guard recreational housing. I next moved! in an apartment in mobile for about two months and finally we were authorized housing on the old Brookley Field in Mobile. It was great because they put three guys in a three bedroom fully furnished house. One of the guys who shared the house with me was from Fort Walton Beach, Florida and he went home every weekend and holidays. The other guy was from Louisiana and he went home almost every three days break he had. I often had the house to myself. Montana threw my divorce out because I was not a resident and was no longer stationed there. I went to Pensacola, Florida in July 1973 and filed for divorce because I was a Florida resident. I left Dauphin Island on 1 Jan 1974 and started the NCO Academy the next day. I graduated from the NCO Academy on the night of 14 Feb 74. I got up at five the next morning and drove to Pensacola, and went to court, and the judge granted my divorce. I was a very happy young man. O. Clark and Sgt. Kynes were my immediate superiors. I learned a lot from both of them that shaped the rest of my business and personal life. Of the three stations that I was assigned to, the 693rd is the only one with anything left operable !